Annually, at the last Saturday of March, Earth Hour is exercised globally, households and businesses are encourage to turn off inessential lights for one hour to raise awareness about climate change. In Cebu, Earth Hour event is given utmost important from establishments like Malls, Business Parks, government and homes. On March 31, 2012 8:30-9:30 pm, Ayala Center Cebu joins Earth Hour and earlier that day, Earth Hour Activities for Cebuano family members are also set to increase awareness to save Mother Earth. Venue: back CIC Main, Cebu Business Park. The Kids Obstacle fun run with obstacle course is for kids ages 6-12 yrs old. For Kids Obstacle Fun Run Categories and Registration refer to above Poster. 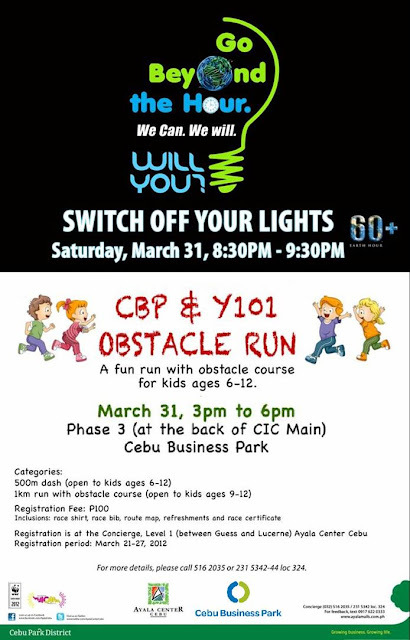 0 comments: on "Ayala Center Cebu Earth Hour Activites: Bio Challenge & Kids Fun Run"